I don’t fish myself, but luckily I do have a source of locally caught walleye or pickerel. As I have been craving an escabeche for some time, my most recent ‘catch’ was used to make this dish of Spanish origin but also very popular in Latin America since the days of the ‘conquista’. Originally escabeche was a way to preserve fish. Marinated in a mixture of wine and vinegar along with vegetables and spices which were removed after cooking, the fish could be kept for several weeks. Nowadays the ingredients are much the same, but it is not used so much as a method of preserving. However, the wine and vinegar keep working their magic and the dish improves after resting a couple of days. It can be served hot or cold, so is an ideal dish for the hot summer months. Some recipes call for frying the fish first. I broiled it after coating with a fine spray of oil. This was not so much to save on calories as it was to avoid the hassle of frying and the fish losing its integrity. This dish has an acidic flavour from the vinegar, and is also spicy, although feel free to up or down the heat according to your preference. I added mustard, cumin and sumac which are not traditionally used but worked very well with the fish. Place the fillets on a broiling tray, spray lightly with oil and broil about 8 inches from the broiler until cooked through. Set aside. Fry the onions in oil until soft. Add the garlic and chopped chilis and fry another two minutes. Add the dry spices and fry another minute. Add the mustard, vinegar and wine and blend completely. Add the salt, pepper and olives, cover, turn the heat to low and continue to cook until the carrots are tender. Pour the vegetables over the fish in a casserole. You may put it in the oven and reheat for about twenty minutes if serving hot, or let it cool and serve at room temperature. Place a few halves of boiled eggs on top. Leftovers can be refrigerated and served cold the next day or three. I am bringing this to Angie’s Fiesta Friday # 70, co-hosted by Dina @ Giramuk’s Kitchen and Molly @ Frugal Hausfrau. Hope everyone enjoys it! Categories: fish, fresh water fish, main dish | Tags: escabeche, Fiesta Friday, fishing, pickerely, preserving fish, walleye | Permalink. I am still learning my way around our property. 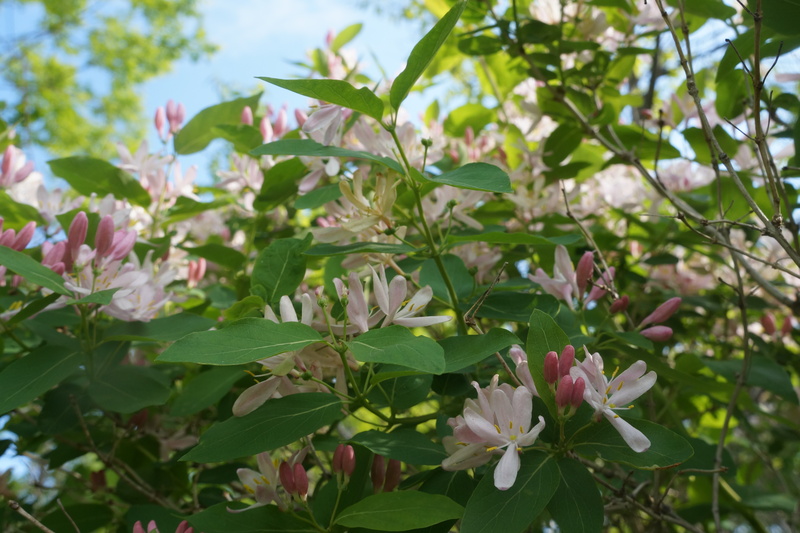 Last year I discovered for the first time a huge honeysuckle bush, and as I went to visit it recently I discovered four more. I took this as a sign that I should continue to experiment with floral recipes. I wasn’t very optimistic, as sweet smelling flowers often have a bitter taste with little of the sweetness associated with the scent. 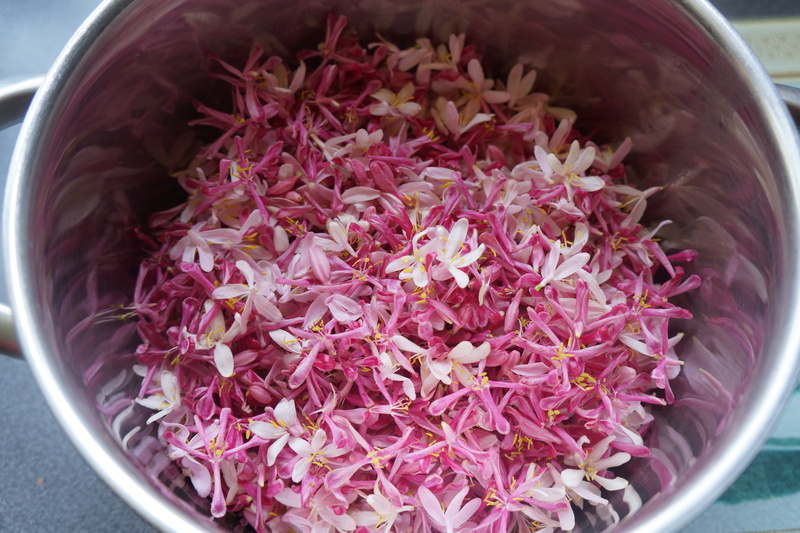 However, I was encouraged by as post by the Green Lizard on making lilac jelly and decided to harvest some of the honeysuckle blossoms. My experiment was not a total success, but I believe I know where I made the mistake. Nonetheless the thin jelly got renamed a syrup, and it is every bit as useful and delicious as a jelly. Sometimes I love my mistakes. Here’s where I went wrong. I decided to make my own pectin from some dried crabapples. Crabapples are full of pectin and by simply boiling them in water and straining the liquid which can be canned the same as any preserve, you have a perfect ingredient for making jams and jellies all season long. I figured dried crabapples would work just as well. My mistake I believe was not to boil them long enough. When I tested for the pectin content after only a few minutes, I noticed it was a bit weak, but thought it would do. Not quite. To test if your pectin mixture is ready, just add a spoonful of the liquid into a small amount of rubbing alcohol. Then wait a minute or two, and if you can scoop some of the juice onto a fork and not have it all run off, then it is ready. I did detect a gelled effect, but only slightly, so there was my mistake. To make the jelly (or in this case syrup) you will need a lot of petals – not necessarily honeysuckle but any edible flower you want to use – at least two quarts. 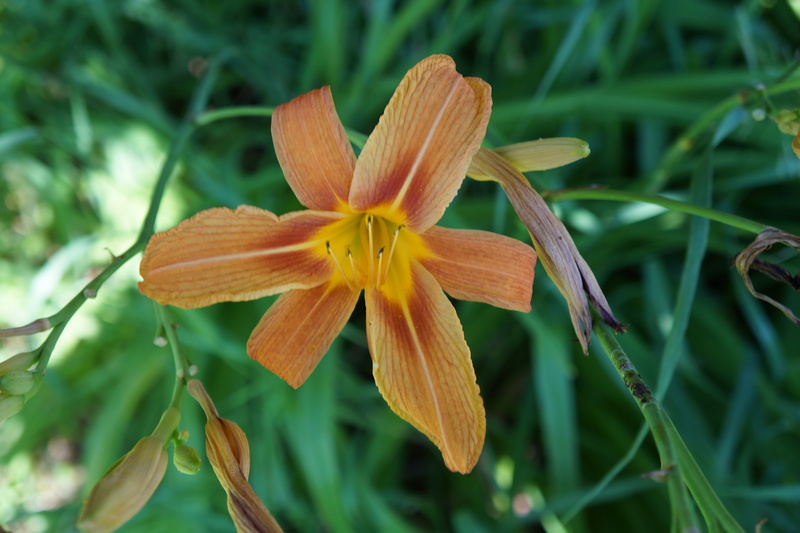 Pick flowers which are opened but fresh looking, and remove the calyx. Cover the petals with water and simmer for about 10 minutes, then cool and refrigerate a few hours or preferably overnight to extract as much of the flavour as possible. Strain and mix 4 parts liquid with five parts sugar, the juice of half a lemon and 1 cup crabapple pectin. Bring it all to a boil and simmer for about five minutes. A small amount of the jelly should set when poured onto a chilled saucer. Skim any foam off and pour into sterilized mason jars. I found the heat of the syrup poured into freshly sterilized jars (by setting them in boiled water for 10 minutes) was sufficient to seal them. I tightened the lids and set them upside down until cool. Two things I discovered: the unappealing colour of the cooked blossoms transformed as soon as I added the pectin mixture, and even more so after the addition of sugar; the flavour was very honey-like, and there was no trace of the bitterness found in the fresh flower. Although it was not as thick as a jelly should be, it was like a good quality liquid honey and can be used in similar ways. Mix with soda water for a cool drink with ice cubes. Here’s hoping we have a good crabapple season this year, and that last week’s frost hasn’t nipped them in the bud! Categories: edible flowers, jams and jellies, preserving | Tags: crabapples, dessert, dried fruit, flower syrup, foraging, home-made pectin, honeysuckle, jelly | Permalink. The season for spruce tips is quickly drawing to a close, so I wanted to present one more recipe using this not-to-be-passed-up-on ingredient while there is still time. I’m told there are slightly different flavours on different trees and that a common favourite is blue spruce. I have been sampling tips wherever I find them, and really can’t say my taste testing has helped me come up with a favourite, but you might want to sample some for yourself. The flavour should be citrussy, sweetish and with a light resin taste. This is the tree I picked from. Something that pairs extremely well with the flavour of spruce is cream, which is why I decided to make a panna cotta. Less rich and certainly less work than ice cream, it makes for a light and refreshing dessert, especially when combined with fruit. Rhubarb happens to be the only fruit I have in the garden just now, so that and a little mint which goes with just about anything is what I used to embellish this dessert I am taking to Fiesta Friday #69. Dissolve the gelatine in hot water. Heat to just before boiling 1/2 cup of cream and mix with the gelatine until it is completely dissolved. Add the sugar and stir to dissolve. Mix the rest of the cream and the spruce tips in a blender or food processor until the liquid becomes a smooth green with not tips visible. Strain through a sieve and mix with the gelatine mixture. Pour into 8 ramekins or other moulds and chill until set. For the rhubarb sauce, sprinkle 4 Tbsp sugar over 1 cup of rhubarb. Allow to rest until the sugar dissolves. Heat the rhubarb until soft. Add 6 finely chopped fresh mint leaves and 2 Tbsp white wine. Bring to a gentle boil for 1 minute, cool, pour over the panna cotta and serve. Categories: dessert, evergreens | Tags: Fiesta Friday, foraging, mint, panna cotta, rhubarb, spruce tips | Permalink. The spring flowers are in full bloom around here – and as spectacular as I have ever seen them. The other day when I was wandering in the woods foraging for fiddleheads I was able to get some pictures of our provincial emblem – the trillium. Even here in Ontario they are a rare sight. 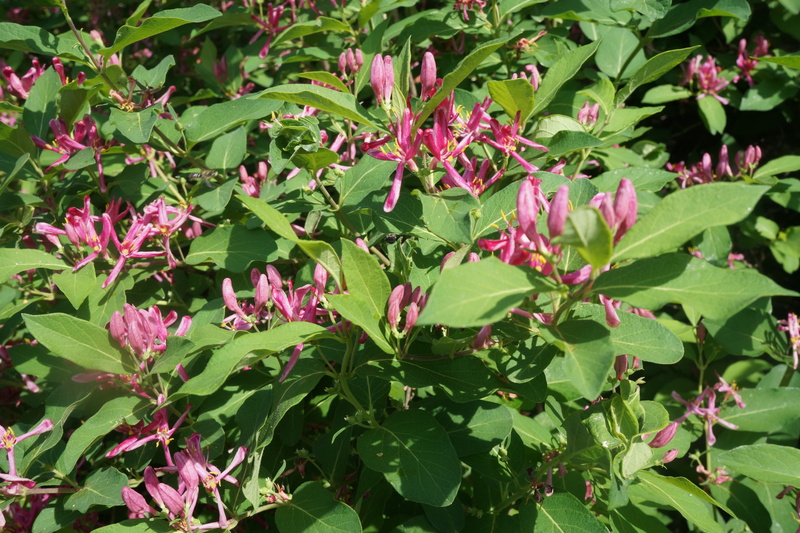 Found mostly in wooded areas, or what’s left of them, they flower only briefly, but if you do find them you are likely to see them in masses. They are truly impressive. And sometimes they are red, and sometimes a cross between red and white. I bought one trillium last year for my garden. It survived but has not bloomed yet. It’s a start. But I do have at the moment a great selection of wild flowers some of which I wanted to feature on this blog and share with the guests at Fiesta Friday #68. Some of the edible flowers I have are: fruit blossoms, lilacs, wild strawberries, violets, forsythia, forget-me-nots, rose scented geraniums. Flowers are not a major source of food – they are often bitter and unless they are served very fresh they do not serve the purpose for which they are intended, which is to prettify the dish. They are finicky to preserve in candied form, and some lose their colour when cooked (e.g. 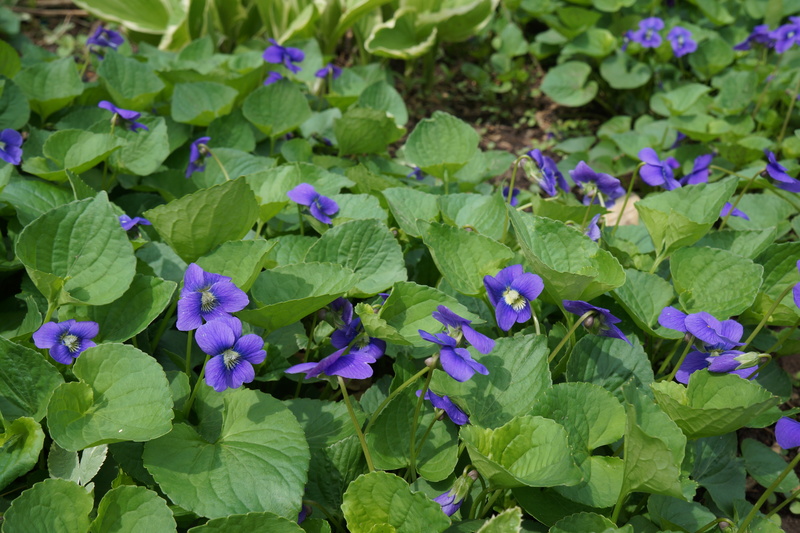 wild violets). I did find that drying them in the oven with just the oven light on, or in a dehydrator at the very lowest setting for about four hours does concentrate the colour and they can then be ground into a powder and used as a colouring as well as adding a distinctive flavour. They can also be mixed with sugar and saved for several months. I used only three colours to decorate these petits fours: forsythia for yellow, violets for purple and a mixture of lemon balm and violet leaves for green. The flavours were floral enough to add a taste of spring, but for the violets I mixed in a little lavender sugar to give them a boost. As the season progresses, I will collect other edible flowers to use in a similar way, avoiding the necessity of commercial food colourings. I made the cake with a gluten-free batter of ground almonds and cornflour, but a sponge cake recipe is also ideal. I baked it very thin in a cookie sheet, divided it into three, and spread the top of two pieces with rose geranium apple jelly. Any smooth seedless fruit preserve can be used. I stacked them and iced the top layer with a white icing made of coconut oil, icing sugar and cream to make it as white as possible. I then cut them into squares and covered them with a royal icing which I divided in four and added the colours to three of them. A little edible fresh wild flower and/or leaves as a garnish and voila! Next time I would bake it a bit thicker and just make it two layers, as the three layers makes it more difficult to slice neatly. I loved using the flowers, and was pleased to have these dainty cakes to serve guests. Categories: baking, dessert, edible flowers | Tags: drying flowers for colouring, Fiesta Friday, forsythia, lavener, lemon balm, petits fours, trilliums, wild edible flowers, wild violets | Permalink. Foraging for Japanese knotweed (polygonum cuspidatum) is not only worthwhile in terms of finding a delicious and nutritious food source. You will also be doing the environment a big favour, as it is arguably the most invasive of all invasives. Initially we tackled a large grove of it growing in our front garden with the lawnmower. We almost succeeded when it occurred to me this might be an interesting wild food, at which point I salvaged a few sprouts, transplanted them to an appropriate area and have just begun to harvest them. If you are not familiar with this plant, here are a few characteristics which should help you identify it. Where to find it: Along roadsides, riverbanks, fields where the earth has been disturbed. Originally from South East Asia it now grows in North America, Europe, Australia and Tasmania. How to identify it: It is usually grown in clumps and resembles bamboo with its hollow stems. The stems are green, spotted with red and divided by joints, or knots. The young shoots are deep red. The leaves are smooth-edged, hairless and broad oval in shape with a pointed tip and hanging from a long stem. Edible parts: The young leaves and stems before they attain a height of about a foot are commonly used. The rhizomes are usually reserved for medicinal purposes. As I contemplated my modest haul, I was wondering how best to prepare them. I must have had a flash from the past, because suddenly the word ‘strata’ popped into my head, a word I have not heard in decades, but am familiar with the dish. That seemed a good place to start, as it involves few ingredients and no strong flavour which might overpower it. Strata is often made to use up old bread, typically with vegetables and sausage (or ham/bacon) and cheese and cooked in a custard. I used a crusty sourdough bread, but any crusty good quality bread will do. I only used cream cheese because a stronger cheese would just be too much flavour, but a hard cheese could be grated on the top if you like. I omitted meat, and pumped up the vegetable content with lots of caramelized onion. Having tasted some raw bits, I thought it tasted like a gentle rhubarb, so used sumac and mustard to pair with the fruity flavour. Ingredients 2 cups Spanish onions, sliced thin oil for frying 2 cups chopped knowtweed stems 2 cups leaves, tightly packed 4 cups bread cubes 1 cup cream cheese 4 eggs 3/4 cup cream (18%) 1/2 cup milk 1 tsp salt 1/2 tsp ground pepper 1 Tbsp sumac powder 1 tsp mustard powder Method Fry the onions in oil gently until they begin to caramelize, about 20 minutes. Add the knotweed stems and continue to fry about five minutes longer, until the stems are cooked. Add the leaves, cover the pot and cook gently until the leaves are wilted. Set aside to cool. Meanwhile, place the bread cubes in a casserole in a 325 degree oven until they are slightly toasted. Mix together the cheese, eggs, cream, milk, seasoning and spices until they are well blended. To assemble, grease a casserole dish lightly and place the bread and vegetable mixture in it, stirring gently to combine. Pour the cheese mixture evenly on top, making sure that all the bread is soaked. Place in a 350 degree oven for about 40 minutes until it is brown and crisp on top and cooked through. This dish lends itself well to all sorts of variations, but I was very pleased with it just as it was. Perhaps if we all made use of this remarkable vegetable, it would not be such a pest. Categories: edible weeds, main dish | Tags: foraging, invasive weeds, Japanese knotweed, polygonum cuspidatum, strata, vegetarian | Permalink. I have been reading a lot of distressing reports lately about the over-harvesting of ramps by irresponsible or maybe just uninformed foragers. 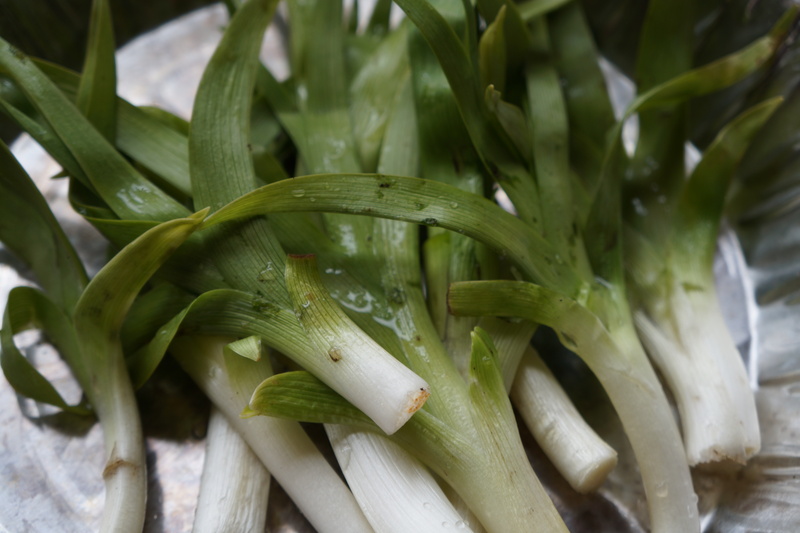 Ramps, or wild leeks as they are sometimes called, are one of those plants which have to be treated with great care, and are on the verge of extinction in some areas in the country. Until I found a privately owned area where I could pick a generous amount but which is cared for by responsible owners, I just did without. If you do find ramps to pick, please be sure to gather just a small proportion of what’s growing there. One way to do this is pick just the centre ones from a clump. They tend to spread outwards, so thinning the middle is a safe way not to over-pick. Another method is to pick just a few leaves and leave the little bulb. There is still plenty that can be done with just the greens. The area I frequent is actually increasing in its ramp production, thanks to careful harvesting and clearing. And now that I have successfully transplanted a small sample into my own flower bed, I hope to have my own to harvest soon. The best way to preserve them and extend their use – a little goes a long way – is to ferment them as I describe in this post here. But for a brief period in the spring I can afford the luxury of using a few fresh ones as I did in this pasta dish. If you don’t have ramps, other spring vegetables such as asparagus, scapes, nettles, garlic mustard etc. would also work well. I made this dish for Fiesta Friday 67 as a follow-up to my spruce tip gravlax last week. This just involved using a good quality pasta mixed with a handful of sauteed wild greens, in this case ramps, and a good amount of fresh basil, plus about five slices of gravlax per person. Toss it all in a bowl and add little fresh cheese crumbled on top, and there you have a super simple gourmet meal. Categories: edible weeds, evergreens, main dish | Tags: cured salmon, Fiesta Friday, foraging, gravlax, pasta dish, ramps, spruce tip salt, wild leeks | Permalink.